I broke down and bought the Artyarns Taj Mahal Shawl kit. Yes, I know. Expensive as hell. But it is so pretty. Meanwhile I am working on Lilli Pilli wrap in Tosh Merino light. My white isn’t quite as white as I wanted it to be, but I think it will be pretty. I’m tempted to join it into an Infinity Scarf. I do have to say that endless rows of garter stitch without any break are boring. Also I found a cool article on scarf patterns. 🙂 Not sure what to knit out of there. I’m biased toward bright colors and gradients. While I was cleaning today – by the way, today is one of those weird days when I can’t seem to sit down for five minutes, because minor stuff just keeps happening – I found a bunch of bulky, very soft yarn in white, grey, and charcoal. There is enough for a scarf and I really do need to make it into a scarf because it’s loose in balls of various sizes, so I suppose something with stripes of varying width. If I don’t knit it up, it will go to waste, because I will just keep shuffling it from spot to spot until it felts on its own. How are your projects going? What are your favorite knitting needles? Bamboo, steel, wood, any particular brand? Love the colors! It’s so pretty that’s its tempting me to try knitting again even though I’m a disaster at it. Look forward to seeing the final work. Thank you for sharing! When I was unpacking I came across about 3 unfinished knitted scarves. I even think one of them is in a pattern in that article you linked. But I don’t like it in the yarn I was using – too thick and stiff. I can finish one of them cos I still see myself wearing it and discard the other two. I also still have my complete set of Aero knitting needles that I was given back in December 1986 when I was leaving the UK … even though I hardly ever knit these days and I might buy bamboo needles to finish that scarf. I like crochet with bamboo hooks, even though I have a set of hooks in somthing else. Ummm, nope that detail escapes me at the moment. I really want to finish my crochet blanket this year, started it 2 winters ago, and now that we’re half way through autumn(fall) I really should crack onto that. If you like lace the Brickless or the Saroyan are nice knits. I really enjoyed but of those. I am currently working of the River shawl. We’ll see how it turns out. I love stripes of color-changing yarns alternating with stripes of a solid color. It’s going to be gorgeous! That is beautiful. Serious skill, hoping when I grow up I will get that good 🙂 Thanks for sharing! I have more than a few stray stashes of yarn:) Time is always an issue, but it’s also a challenge to balance knitting with typing in terms of wrists and a hands, and writing tends to win out. That said, I love my KnitPicks Interchangeable Rainbow Wood needles. In a fit of amateur enthusiasm, I picked up the full set plus extra cables and ends and such. Sure, I hardly ever use the teeny tiny needles, but I could! I have 3 projects started in various stages of completion. A lace Afghan, a simple scarf and a cable sweater coat. I’m almost finished with the scarf. I seem to gravitate to shades of red or pinks or shades of grey or black, one color at a time. When I get bored with one I start on one of the others. I prefer Knitters Pride circular needles and their new circular needle protectors. The protectors keep my projects from slipping off the needles when I’m not knitting that project. Attempting the lotus baby blanket (http://www.9-stitches.com/blog/knitting/knit-baby-blanket-pattern) but it’s killing me. I keep getting to the same line and messing up. It’s frustrating. Then I’m looking for a zig zag blanket (but may have to go with crochet for it) and a newborn or baby knit sundress in scallops. My bestie is having a baby and I’m super excited!! Or look for “chevron” as an alternate term. Good luck! I don’t knit as much as before, except for socks which I always have in the go. My favourite needles are the Denise interchangeable needles. I used them for knitting in the round or as straight knitting. Needles. They are light and perfect for light or heavy projects…and come in a very handy case. I gave most of my fiber arts stuff away when I moved to the housebarge, and then across the country. * About the only thing I brought with me was my favorite drop spindle. So everything I’ve picked up in the meantime has been project specific, and I’m not doing a lot. * Well, the spinning wheel and looms went into long term loan, and then the person they were loaned to gave them away without consulting me… and I decided that some battles just aren’t worth it, especially since I approved of the new owners. Two projects. A baby blanket for someone scheduled to arrive in August and a hat for said person’s older sister. The blanket is in cotton yarn and the hat is bamboo yarn. Thanks for the knitting post. I am currently working on socks ( 3 pairs for family members), a shawl for me ( I don’t think I have the gauge right so may have to rip it out) a sweater (that I’m beginning to hate the yarn) and a potholder ( double knitting) Potholders/dishcloths are great for learning new stitches and they finish up quickly. Right now I’m learning double-knitting so I can try the Lord of the Rings Scarf. I’ve got to stay off ravelry so I quit collecting patterns. Right now I live six hours north of Winnipeg, Manitoba and getting yarn is difficult. There are so many great yarns online but the shipping costs are horrendous! Have you checked out http://www.lanitiumexmachina.com/ ? They have a shop on Etsy too. Their yarns look fantastic. I like bamboo needles but discovered I bend them. I tried some metal ones too and bent those as well. So I’m back to bamboo because I prefer natural materials. Please post again as I love to see your progress! I knit with Bamboo, usually circular needles just because I find I drop stitches less that way. For crochet I use metal hooks. I tried the bamboo for crochet, but it didn’t feel right in my hands. For needles I love the Addi circulars – http://www.addineedleshop.com/ They are smoothe, rotate well and pliable. I am always working on several projects – my current ambition is a star chart of the northern hemisphere – http://www.ravelry.com/patterns/library/celestarium – worked in some very nice yarn from Gynx – http://www.gynxyarns.com/allcolorwaysnz – (CW: Witch Witch). It should be suitably skyish once all the beads are in place. I like hats. I refuse to knit scarves. I did once knit myself a very beautiful sweater that was too hot to wear – it was an angora/wool blend yarn, so lovely and soft… I did wear it a couple of times in Alaska when I didn’t want to carry a coat. Favorite simple stitch pattern is seed stitch, and favorite technique is double knit. When I teach, I use short straight needles, but for my own projects I prefer my interchangeable circulars with extra short tips. I knit tight but hate plastic needles, so mostly metal, but Knit Picks and Knitters Pride tips are smooth enough for me to work with. I also really like to mix it up with square tips. Right now I’m experimenting with spinning my own yarn, so I only have one hat and one sweater on the needles at the moment. I love knitting. Speaking of random stripes, I found a really cool Random Stripe Generator free online back when I was making a 2 color throw for my daughter. Turned out great! Just keep refreshing the sequence until it matches what you have in mind. Hope it works for you! My typical go to needles are the Addi’s but I’m beginning to try some of the other brands for various projects. I’m currently working on the Sans Suri cardigan in the Top Down book by Elizabeth Doherty in a class in one my the local yarn shops. This is a new way of knitting a sweater but I’m enjoying it very much. I hadn’t knitted for ages, but I’m expecting a grandnephew in June so I started working on a cuddle bear for him http://www.ravelry.com/patterns/library/cuddle-toys-bear. I’ve been using Knitter’s Pride circulars Nova Platinas, round (they have a cubic variety). The tips are pointy and tapered, the yarn moves smoothly over them, they are light, and when they rub together, I don’t get the chills from the metal on metal (they are chrome plated). I like Karbonz for smaller stuff because they are so strong, and I like wood for slippery yarns. Been using circulars rather than straights or DPs mostly. I tried the magic loop method and I ended up with the stitches not looking right, which means I’m doing something wrong. I’m making some socks from leftover yarn, but now I have to find a heel flap I like. I didn’t enjoy magic loop. I found success with second sock syndrome with two circular needles. 9″ circulars have been recommended to me. I’ve been using the two circulars for one sock and just doing one at a time, or else taking the first sock off the needles, knitting to the heel, do both heels, and then finish. Love the karbonz! They’ve become my favorite type of needles to knit with, though with Icelandic wool, I will switch to a Denise or clover bamboo for the stubby needle tips. And for anybody who reads this and is interested, there’s a local estate sales shop that did a sale for someone who had at least five or six spinning wheels. Nice ones. They still have at least one, and I’m not sure of the cost, but I’m certain they’d do a good deal. I could put you in touch. I would love to know what they have. I love it when you post about your knitting, and your Lilli Pilli is looking great! My favourite needles are usually circular Addi Turbo Lace needles (the ones with the brass tips), in the 32″ length. You can knit in the round, back and forth, magic loop, or travelling loop. Basically, you could use them for almost any knitting you might want to do. Wow! I’m in awe of the mad skills you ladies exhibit in the knitting arena. I tried both knitting and crochet with wonky results. It’s sad when bad things happen to good yarn. Personally I’m more comfortable in the tool aisle at Lowe’s. Right now I am painting a salvaged china cabinet from the 1940’s. Normally I wouldn’t paint such an amazing peice, but the repairs would be obvious if I attempted to stain it. I’m going with a daring shade of beige for that French country look. Currently, I have three projects cast on. I try to have projects with varying needle sizes to help with hand/elbow issues. I am knitting Elfe, a stripped top down seamless stripped sweater (and I am going to lengthen the sleeves) with a hand dyed alpaca, cashmere, silk blend from Fierce Febers (Hillsboro indie dyer) and a tonal solid from Hazel knits, a pair of socks (trying Bordhi’s after thought leg, this time on nine inch circulars) with some Lemonade Shop yarn, and a scarf with drafted but unspun silk from hankies I dyed last summer. I mostly knit on addi turbos. I just finished Omena with worsted from Sweet Georgia in a color they did exclusively for Stash (Corvallis–our wonderful brick and mortar sanctuary) last year–love it. It is a little garter stitch but you switch every three rows and it’s a circular shawl/vest like wrap that is awesome to wear. I have a meeting in Portland in. Couple of weeks so what is your favorite yarn shop there? I have not done any of the yarn crawls–I am always afraid it will be overwhelming and break the bank. I’m familiar with most of the nice selection of patterns in the scarf round up. If one is a beginner but wants something a bit more interesting the Hitchhiker by Martina is the winner in my opinion. Also one can go as long or as short as one wishes. Be aware that the Mistake Rib Scarf, which is very nice for guys too, is a bit deceptive as far as the width vs the advised cast on stitch count. It pulls in, so be sure to add necessary stitches if it’s needed to be somewhat wider than shown. My most successful project was an afghan composed of all of my yarn scraps from previous projects, even if they were only 3 or 4 stitches. It ended up wildly colorful, huge, and admired by all who saw it. There was no planning; I just picked up the next color at random. I didn’t think of it then, but I could also have changed out the stitch when I began a new row. It was definitely unique. I recently finished Snowmelt and am in progress on one of Baah yarns Dipped and Dappled faux argyle scarves (see her IG for pix and how-to’s). Also swatching for a linen Tee.. I love my chiagoo interchangable lace set. I can’t go past bamboo needles. And I knit jerseys and cardigans. Complicated aran patterns are the best! Mind you when you knit a jersey because you like knitting the pattern you often get something unwearable. I’ve been through a phase of unpicking a lot of jerseys that were fun to knit but crap to wear and knitting them up into stuff I will wear. You feel very virtuous using recycled wool. I’ve tried different needles and I like metal needles for wool and wool blends. I started with bamboo but they drag a bit sometimes. I’m currently leaning how to knit octos for preemies and I also have a scarf startin problen. I like my bamboo needles but my metals slide better…I had 3 sets of metal circular needles break..
Knitting projects: I have just finished two baby blankets… I am trying to be positive. My 23 yr old grandson is going to be a father. He and his girlfriend lived together for a year (8/15-8/16) and it was a nightmare for him. She knew around May that when the lease was up, her free ride was over…so she got pregnant. I’m just sad about it all. 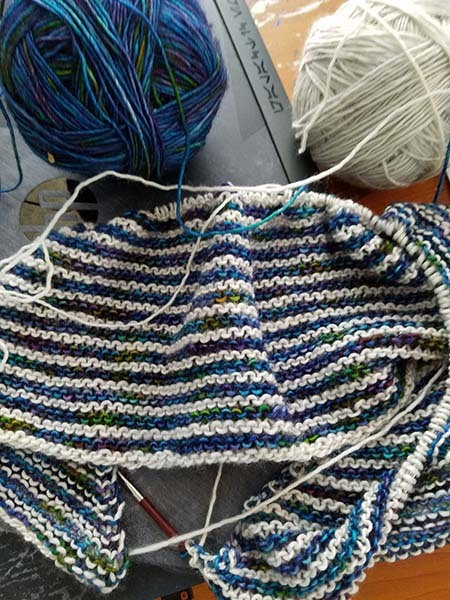 i loved hitchhiker by martina behm- just enough interest that i had to pay attention at the end of the row, but the middle was easy ‘time to chat’ knitting. and as long as i remembered which row i was on, i didn’t need the pattern- easy to memorize. i made two. may make another one. saroyan is beautiful, too. i made two- one a scarf that i regret not making in garter instead of the pattern suggested stockinette. another shawl that i did make in garter, in a gorgeous blue. the charted leaf part required attention, as did remembering which row the increases and decreases were on. i prefer metal needles, specifically chiagoo or addi. i have used lykke needles, made from driftwood, which are the loveliest wooden needles i have ever touched. if i need wood (it is a bit less slippery, so better for when i knit with bamboo yarn or silk) i will use lykke. I knit using a knitting machine (of which I have 6). different skill set, usually, the same end product. It allows me to knit a row much faster than when I knit by hand, but it also means that I can mess up a huge amount of stitches in one breath. but I don’t have to worry about numb hands with my machines- unlike hand knitting and cervical spinal problems.